Adventure is waiting for drivers of the 2015 Toyota RAV4 Brampton ON who like to tread off the beaten path. The 2015 Toyota RAV4 Brampton ON is a great option for anyone in the market for a capable, well-qualified SUV that can handle a number of different terrains and situations. The 2015 RAV4 is available with features such as four-wheel drive and a six-speed electronically controlled automatic transmission with intelligence so drivers can experience the smoothest of smooth rides, not matter where you are going. The 2015 Toyota RAV4 Brampton ON is exciting and new, especially with all of its new features. The vehicle is sleek, streamlined and efficient, which is exactly what you would expect from a Toyota, even an SUV!Also exciting about the 2015 Toyota RAV4 is that it won a Top Safety Pick award from the Insurance Institute for Highway Safety. Timing is everything and no one wants to be up a creek without a paddle, so get the vehicle that can do it all: the 2015 Toyota RAV4. Your vehicle is an important part of your life in Brampton ON. It gets you through all of the snow and sleet in the winter and the unexpectedly hot and humid summer nights. It can take you to the office during the week, but can also help you navigate through the numerous trails that are ready and waiting to be scouted in the Brampton area. Rush hour traffic is nothing for the 2015 Toyota RAV4 Brampton ON because it is extremely efficient and has an outstanding suspension system that allows drivers to stop on a dime and handle corners like a champ. It has a maximum fuel economy rating of 24 city/31 highway mpg and comes with a 2.5L 4-cylinder engine that makes 176 horsepower and 172 lb.-ft. of torque. Take a minute and get lost in the 2015 Toyota RAV4 Brampton ON today. The 2015 Toyota RAV4 Brampton ON is quite the catch in terms of power and efficiency, but did you know that it can also tow up to up to 1500 pounds and has a maximum cargo volume of 73.4 cubic feet? This vehicle is extremely safe, as we mentioned before that it won an Insurance Institute for Highway Safety Top Safety Pick award for being one of the safest, most capable vehicles in its segment. It received top ratings for crashworthiness, including roof strength and head and seat restraints. Other safety features that are standard with the 2015 Toyota RAV4 include a blind spot monitoring system with a rear cross-traffic alert, a lane departure alert system, a tire pressure monitoring system, multiple airbags as well as driver and front passenger whiplash-injury-lessening seats. 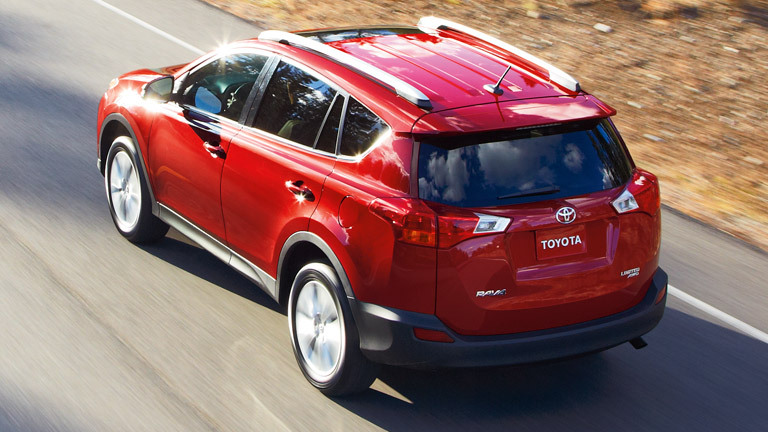 Contact us to set up a test drive today and see how much you love the 2015 Toyota RAV4!